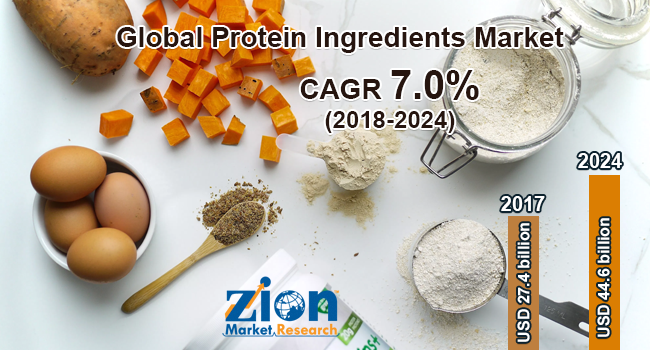 With the presence of a large pool of participants, the global protein ingredients market is displaying a highly competitive business landscape, finds a new research report by Zion Market Research (ZMR). Mead Johnson, Bunge, DuPont, Cargill, Nutra Science, Burcon, Rousselot, Scoular, Tessenderlo, and ADM are some of the key vendors of protein ingredients across the world. These players across the protein ingredients market are focusing aggressively on innovation, as well as on including advanced technologies in their existing products. Over the coming years, they are also expected to take up partnerships and mergers and acquisitions as their key strategy for business development states the protein ingredients market study. Citing an instance, on September 18, 2018, Epi Ingredients – a major global distributor of dairy items & a division of French-based Laita firm—launched SoBenefik– a high-protein yogurt concept and product that can be manufactured only through the help & use of ultra-filtered dairy powders. As estimated in this report, the global protein ingredients market earnings are valued at US$ 27.4 billion in 2017. Witnessing a tremendous rise during the period from 2018 to 2024, the revenue in this protein ingredients market is expected to reach US$ 44.6 billion by the end of the forecast period. “Favorable government policies to promote farming activities along with massive funding of agro-business activities are the key factors driving the growth of protein ingredients market,” says the author of this protein ingredients market study. Apart from this, the growing demand for processed meat as a result of shifting preferences towards protein-rich nutritious diet is expected to boost protein ingredients market revenue during the forecast period. In addition, growing application of proteins as food ingredients in cereals, bread, baked goods, protein biscuits and bars, sauces, soups, nutritional beverages, meat products, and nutritional supplements are likely to open new vistas of growth for protein ingredients market in the years to come. Furthermore, the product finds myriad applications across cosmetics, food & beverages, infant formulation, animal feed, and pharmaceuticals. Regionally, North America has been leading the worldwide protein ingredients market and is anticipated to continue on the dominant position in the years to come, states the protein ingredients market study. Rise in the intake of snacks, cold cereals, and energy bars having proteins as major ingredients is the key factor behind the dominance of the North America protein ingredients market. Product launches by key market players such as Mead Johnson and Cargill highlighting on fulfillment of consumer requirement for cholesterol free as well as saturated fat beverages in North America is another significant factor that is supporting the progression of this regional protein ingredients market. In addition, tilting trend of consumers towards health benefitting soy-based items along with U.S. FDA approval of these soy items has resulted in widespread use of protein ingredients in cosmetics, food, and infant formulations across North America, thereby further expanding the business sphere.